While drivers are living out their dreams on the track at the IMCA Speedway Motors Super Nationals fueled by Casey’s, Veronica Anderson is living out her dream in tech. The 19-year-old daughter of Late Model Director Randy Anderson has worked full-time as part of Executive Director of Competition Dave Brenn’s crew at Boone Speedway this week, doing everything from checking safety gear, carburetors, and ignition boxes to pulling mud plugs. 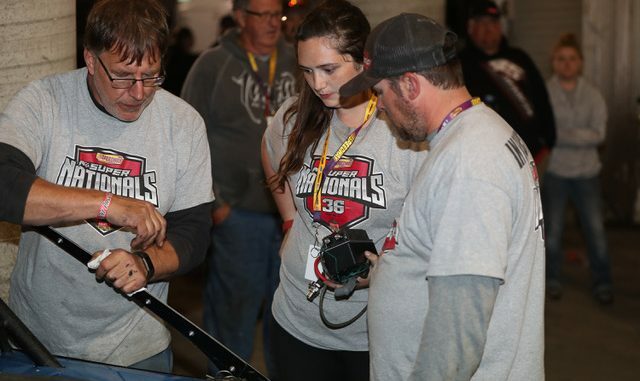 Anderson learned the tech inspection ropes from her father and more than a few dinnertime conversations have been spent discussing the finer points of the job. She’ll go home on Sunday, get moved to Chicago on Monday and then start a job with Mercedes Benz on Tuesday. Anderson hopes to start her own racing career next season at Quad City Speedway, in a street stock she’ll build with her dad.